Your Journey to Studio Success Starts Here. Take control of your studio. MTJGD provides systematic principles, methods and rhythms for running a successful studio so that you can reach a work-life balance. Develop a roadmap to maximize growth potential and financial freedom. Improve your leadership skills, transform your staff, and create a positive culture. Join like-minded studio owners in a uniquely, positive and collaborative environment. Cutting edge, university-styled business course open to non-members. This works and we’ll prove it! Take a FREE 24 hour tour of membership! Receive an insider view of resources, tools and training that are changing businesses around the globe! Get unprecedented access to our private Facebook forum and receive a free download of Misty’s best selling book, One Small Yes™! Our members are regaining control of their lives, getting out of debt, expanding programs, raising up leaders in their studios and having a positive impact on their communities–all while making time for themselves and their families. Discover the More Than Just Great Dancing® difference! To join this exclusive membership and become an affiliated studio, memberships are subject to a one-time initial license fee of $1,295. For your convenience, licensing fees can be set up in payment plans of up to 24 monthly payments. 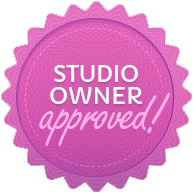 Studios with multiple locations have an additional licensing fee of $695 per location and a second location monthly fee of $149 (Basic) or $249 (Premium).